-All rooms have A/C and Hot Water. -Free Breakfast for all guest. -Free luggage storage for returning guest. -Free new kitchen available for guest use. 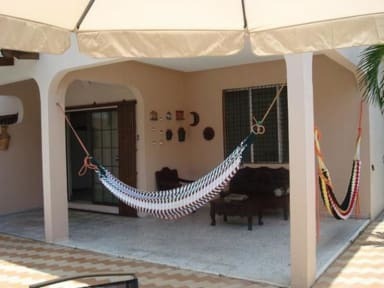 Great House, Great beds, Great Chill out Area choose between stay and relax by the pool or in the hammocks or go out and within walking distance you will find the new Galerias del Valle Mall also a varieties of restaurants, bars and night clubs. 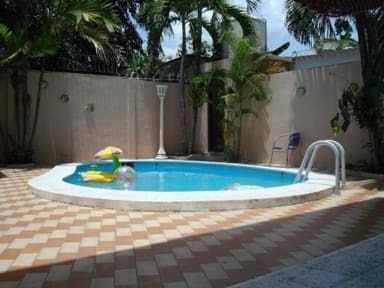 We are located in Colonia Universidad, a very safe and quiet residential area of San Pedro Sula. Use as a base for trips to Copan Ruins, The Bay Islands, La Ceiba, Tegucigalpa. BE AWARE : ALL our rooms have Air Conditioning ( San Pedro Sula has a hot and humid climate). No lockout curfew , reception open 24hrs. Eine top Unterkunft in SanPedroSula. Ich musste nach einer kleinen Operation ein paar Tage ausruhen und das Posada war wirklich spitze für mich. Das Frühstück war abwechslungsreich und mittags/abends hat mir Rosi essen bestellt. Vielen Dank für die familiäre Atmosphäre!